The family of Eric Garner recently agreed to settle the estate's claims against the City of New York for $5.9 million. What is perhaps most notable about the agreement is that, once again, the deal was brokered on behalf of the City by Comptroller Scott Stringer. Whatever one's thoughts about the dollar amount, it's a good deal for all sides. The biggest beneficiary? Possibly Mayor Bill de Blasio. The entire City of New York needed this case to be resolved quickly. A protracted legal and public relations battle would have been a disaster and could easily have turned into something very, very nasty. It was important that all sides come together and acknowledge what had happened and make a public showing of contrition. That it happened prior to any actual litigation worked out just perfectly for de Blasio, who must have been dreading this lawsuit. In NYC's government, the public fisc is overseen by the Comptroller, who is an independently elected official outside of the Mayor's command. As the CFO for the city, the Comptroller must approve any and all municipal settlements of any size. At the same time, all litigation against the City is handled by the Law Department, which is under the Mayor control. Thus, once a case is actually filed, all negotiations with plaintiff's counsel are carried out by an assistant corporation counsel, who reports back up a lengthy line of command at the Law Department. While the Comptroller still must authorize any settlements, the Mayor is ultimately the public face of the defense. However, there is a brief moment in time when plaintiffs can sometimes negotiate directly with the Comptroller; this occurs after a notice of claim is filed (i.e., a form setting out a person's intention to sue the City) and before the lawsuit is commenced. The Comptroller routinely settles small matters prior to suit, but rarely becomes involved in larger cases, albeit with some exceptions. That is what happened here. Garner's family was on the cusp of filing their lawsuit, an event that would trigger the Law Department's involvement and make it impossible for the Comptroller to directly negotiate a settlement. The parties ultimately agreed to the $5.9 million figure to resolve the City's exposure. It's a good outcome for the Garner family for a number of reasons. The most obvious are immediacy and closure. The litigation would likely have been painful and ugly. For instance, a fundamental question would have been Garner's life expectancy and earnings capacity, which was not remotely close to $5.9 million. A protracted battle would drag Eric Garner's family through the mud over and again for at least several years, with no guarantee that they would ultimately receive as much or more as what was on the table now. The amount paid fairly compensated the family and permitted them to move onward and forward, and to do so without undue stress or delay. It's a good outcome for the City as well. First and foremost, the settlement closed out an ugly chapter in the NYPD's history of racial conflict with the general public without needlessly ripping open the still near-raw wounds. A vigorous defense would most certainly highlight and inflame the ongoing conflict between the NYPD and communities of color. Avoiding such a necessarily nasty and sensitive battle by acknowledging wrongdoing (denials of liability in the paperwork notwithstanding) is a healthy first step towards reconciliation. From a dollars and cents standpoint, the settlement saves the Law Department thousands of labor hours. 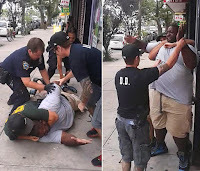 Moreover, while the compensatory damages claim might be somewhat limited by Eric Garner's low earnings potential, there was a high likelihood of significant punitive damages. Consider this: that Daniel Pantaleo employed a choke hold is evident in the video. That such choke holds have long been barred by the NYPD is also beyond dispute. Finally, there is ample evidence that officers have continued to use these banned holds without any reprisals from the NYPD, which has resulted in the continued use of these holds. There is no telling what an angry jury would do with this info in terms of assessing punitive damages. Finally, it's the best possible outcome for Mayor de Blasio. The mayor ran for office on a platform that was critical of the NYPD's race-based policies. His actions since the election have harmed his relations with the rank and file, causing him to be viewed in certain circles as "anti-police." Had this case been litigated by the Law Department, de Blasio would have been in an impossible position. If the City lawyers attacked the plaintiff, de Blasio would be alienating a large chunk of his constituency. A less than vigorous defense (or a settlement down the road) would leave him open to further attacks by police supporters. In short, every action would antagonize, every statement would inflame, and de Blasio could only lose ground with voters. By settling, Stringer has helped the parties and the city begin a healing process that is desperately needed, guaranteed the Garner family just compensation, and saved de Blasio from what would have been a political and public relations nightmare by taking the mayor off the hook entirely for the settlement. It's a win all around.